That would sooo be my hubby! What's with men and cars!! My husband and I are always annoyed by those. Do you need to say "look at me" quite so loud as to put it in yellow? I'm glad that my husband would just look at such cars with the "That's an expensive car" attitude instead of "That's such a beauty". Both of us would certainly give those cars a second look but not til the extend of taking pics and ooh-ing and aah-ing over them. I gave both my children one of those cars for Christmas. My son's is yellow and my daughter's is black. They run on different frequencies so they can race them in the kitchen and chase the dog at the same time. Great mileage with rechargeable batteries. Yeah, I am not so impressed by stuff like that either. When Imet my husband he had a really nice sports car and my mom kept teasing him after we got married about when he would trade it in for a "family car". Ha! We don't have it any more. And yes, we have a family car now. Have a great night! I think they have a car gene embedded somewhere in the Y chromosome. It kind of looks like a fancy taxi cab. Men and cars..When they were small they were crazy about toy cars..when they grow older they go crazy with the real thing. Usually they would buy expensive cars to impress women but the truth is some women just don care..
haha men are so funny. they love their flashy cars! me? i just think of batmobiles when i see these kinds of cars lol. Thanks for the comment. I hope you take pics if you ever make cute lunches for the kids! hehehe.omg all men are same. I drive my Toyota and am happy with it. My hubby loves to talk about cars but a Lamborghini is out , out of our radar!! Men and cars, just like women with shoes and purses..Fun post! I love those Chevy Suburbans or maybe, just maybe a Nissan GTR sports car, a quarter of the price of your 'yellow car'....for old times sake.....but know what my wife will say, ha ha. You have a nice day.....Lee. Ps, was just thinking how a long haired sarong kebaya hot pot will look like inside that yellow car, ha ha. buckeroomama makes a good point! Thank goodness my husband could care less about fancy cars! Besides, that car wouldn't do too well in our Maine winters!! my girl friend is really bad with cars. once her guy friend wanted to impress her with his new Lamborghini but she mistaken it for a Corvette. The poor guy was devastated for the rest of the night. Yeah I am one of those girls who would notice this car. I just looooooove speed, though. I don't care what type of car it is. 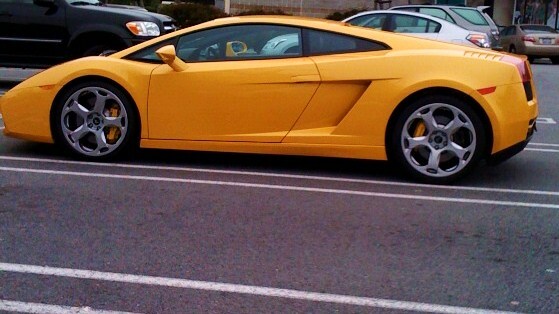 I've been known to take photos of exotic cars. Living in Europe, I see them a lot more often, so it's losing its momentum...ok I am lying, I still gush. Haha. But yellow? I can not stand yellow cars!